MSI and IHC can be used alone or together. When used alone, MSI and IHC may miss some cases of Lynch Syndrome. For example, MSI alone may not detect cases of Lynch Syndrome due to MSH6 mutations since MSH6-related tumors are sometimes MSS. On the other hand, IHC alone may not detect cases of Lynch Syndrome due to mutations that result in full length, but dysfunctional protein. There is no consensus on whether MSI, IHC, or MSI & IHC is the ideal screening tool for Lynch Syndrome. 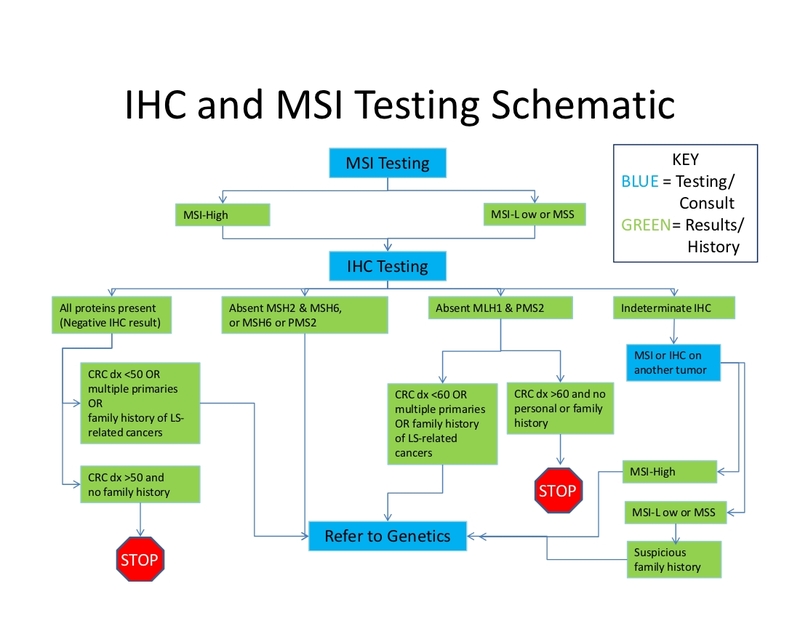 Some centers start with MSI testing and then perform IHC on tumors that demonstrate microsatellite instability to help direct genetic testing. Others use IHC as the sole screening tool. Some centers perform both tests simultaneously to provide as much information as possible. For cases that are suggestive of Lynch Syndrome, it may be helpful to perform both tests to provide as much information as possible.